"This guitar has been displayed and demoed on a salesfloor. It has no major or minor scratches, dents or dings. The electronics work with out out any issues. 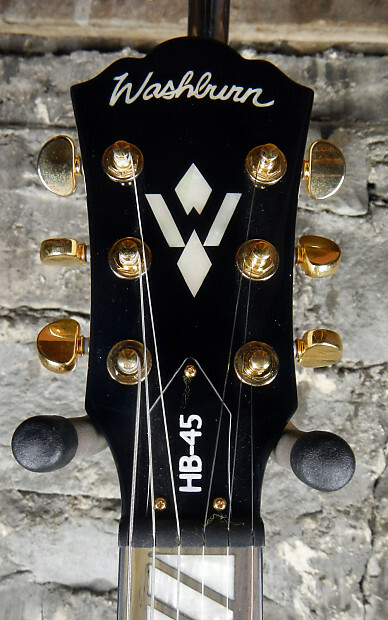 This guitar is not being sold as brand new as we have had it displayed and used. If you have any questions please feel free to ask and all photos are of the actual guitar being sold. " 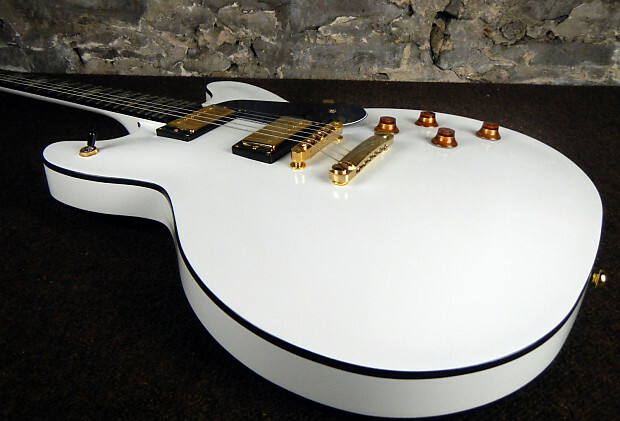 This Washburn Hollow Body is quite the looker with its gloss white finish on its hard maple top and sides. 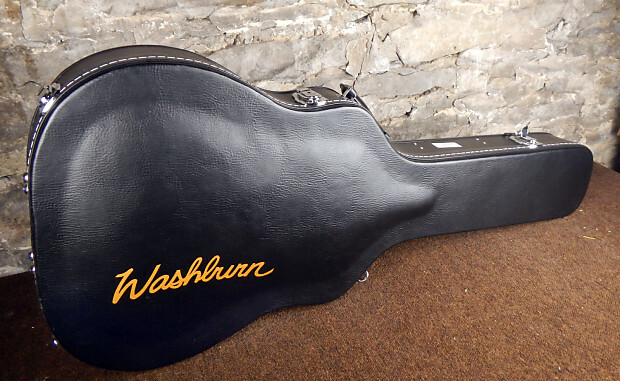 It comes standard with a Washburn hard case to keep it safe on the road or in storage. 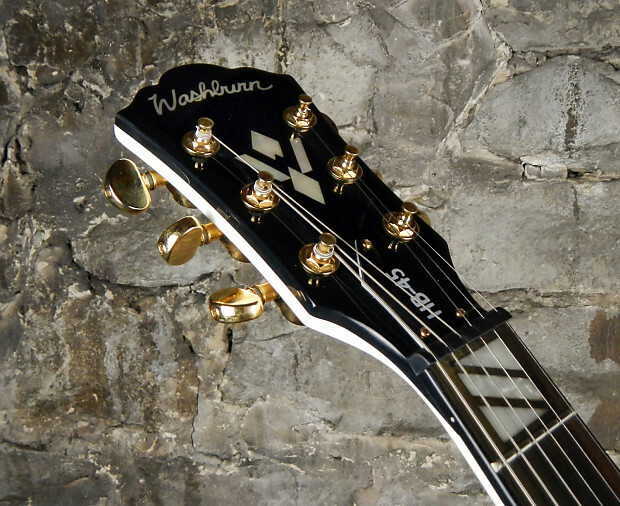 With a Tune-O-Matic bridge and Grover exclusive tuners this guitar will stay in tune with ease. The Rosewood 22 fret fretboard is set with Pearl/Abalone Split Block inlays for a classic look. 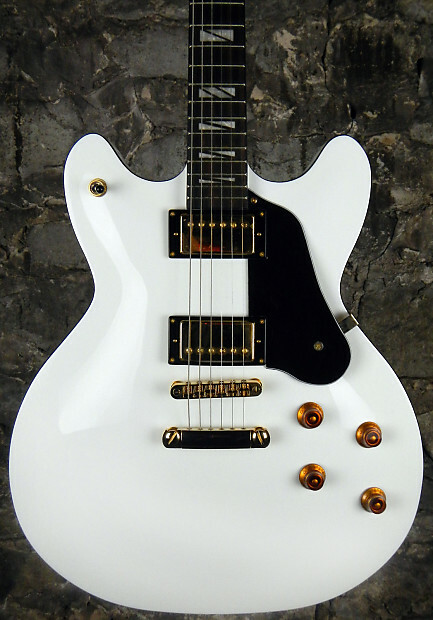 Equipped with Dual Humbuckers this guitar has a warm tone. 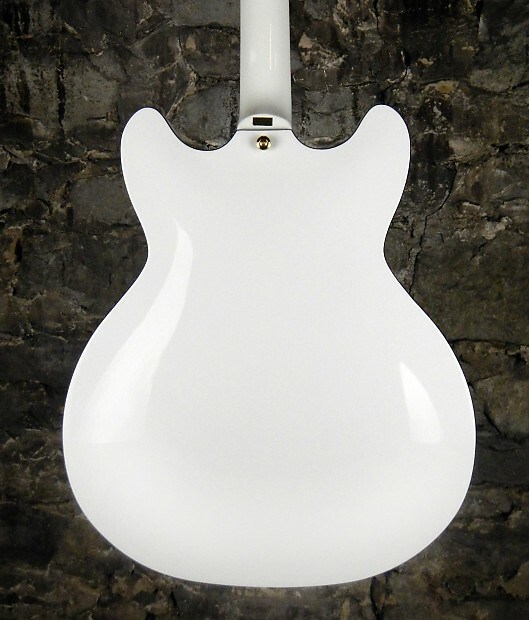 With its closed top this hollow body is less susceptible to feedback at higher volumes. 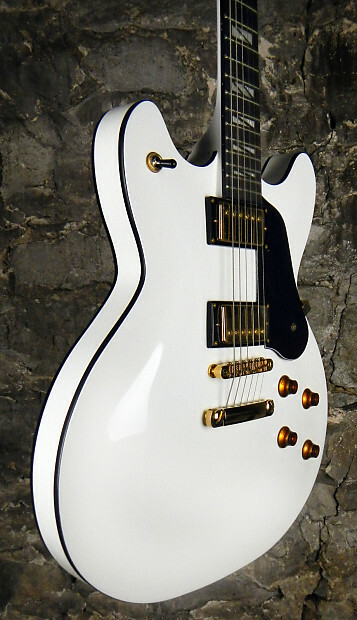 This is a Great mid range guitar! 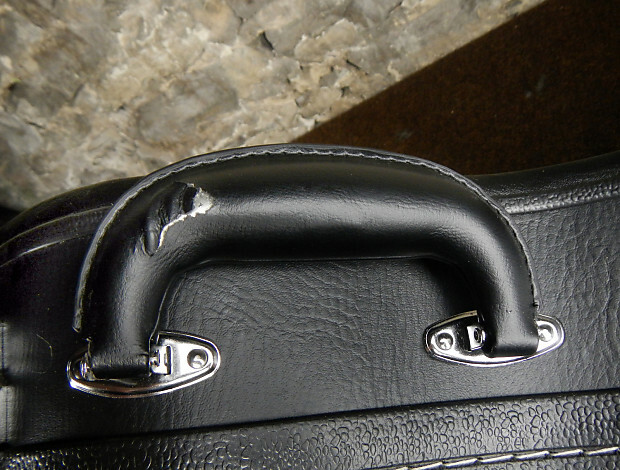 Hard case has slight damage on handle reference photo included. Standard UPS ground is used to the continental USA. Buyers MUST request "signature required" if needed. If you refuse a package upon delivery, the return shipping charge billed to us will be subtracted from refund. Original shipping charge will also not be refunded. It is the responsibility of the buyer to following tracking info and make sure your package is not being held locally because of bad weather or you were not at home. If an item is returned to us because you were not able to receive it or had an incorrect address on your account, you must pay additional shipping to have it sent a second time. Mid Michigan Music is not responsible for any items left on porches or at the front door of address given. USPS requested shipments will result in an additional single business day delay. Shipments cannot be redirected to different addresses after payment is made. All P.O. Boxes MUST have a street address and number. Only small items can be shipped to P.O. Boxes. Mid Michigan Music must be notified within 14 days of receiving item to qualify for refund or return. Buyer pays return shipping unless merchandise is found to be defective by manufacturers standards. After 14 days items must be returned to manufacturer for warranty coverage or defective claims. All items are displayed on a showroom floor so if you have any questions on condition or have any questions in general please feel free to contact us before purchasing. Shipping charges cannot be refunded. Returns for defective items will be tested before refund is given. There is a 10% restocking fee with items found not to be defective and item must be in exact same condition as when it left our store with all original packaging materials to qualify for refund. Occasionally a 15% restocking fee is applied, for items found not to be defective and in addition have been mounted, assembled, soldered or altered. This is due to these items being resold as used. These policies don't apply to any used, new old stock, demoed or sale items which are sold as is. Thanks and please contact us before purchasing if you have any questions. Mid Michigan Music tries to work out the best solution for our customers and will help where we can.